The ExtendAire I System is integrated to the Firehawk® Second Stage Regulator's intermediate pressure line. Coupling the system's 40-inch rescue hose between SCBA, provides both firefighters with intermediate pressure air for emergency escape. MSA's ExtendAire II System offers an integrated rescue hose used with the PR14 First-Stage Regulator that features both male and female quick-connect fittings. The system is stowed in a waist pouch that mounts on the carrier assembly and is designed to prevent snagging and accidental opening. The ExtendAire II System also connects to the ExtendAire I System for additional system flexibility. MSA's M7 I-HUD Receiver for FireHawk M7 Air Masks is worn on the INSIDE of your facepiece. New LED light patterns enhance safety and security. Unit automatically syncs with SCBA upon startup. Sleek design offers 40 percent weight reduction compared to our external HUD. MSA's I-HUD Receiver is available only with the FireHawk M7 PASS device. The G1 SCBA from MSA is the most comfortable, streamlined, balanced, configurable, and customizable SCBA we've ever produced. The G1 SCBA is designed solely with your safety and comfort in mind. The G1 SCBA offers integrated and enhanced solutions to exceed your needs today as well as years into the future. There is a new way to deal with replacing SCBA Alkaline batteries - DON'T. Introducing the first NIOSH approved and NFPA compliant SCBA platform to provide a rechargeable battery. There is a new way to deal with replacing SCBA Alkaline batteries - DON'T. Introducing the first NIOSH approved and NFPA compliant SCBA platform to provide a rechargeable battery Smart Charger. The Quick-Fill System is simply a system that allows for rapid transfer of air from a high-pressure source into a cylinder containing less pressure. This air transfer is based upon one of the oldest and most fundamental laws of physics: Boyles Gas Law. This law demonstrates that when two gas sources of different pressures are connected, they seek to equalize at the same pressure. For example, when an air cylinder pressurized to 2000 psig is connected to an air cylinder of the same size pressurized to 1000 psig, the two cylinders will quickly equalize at 1500 psig each. 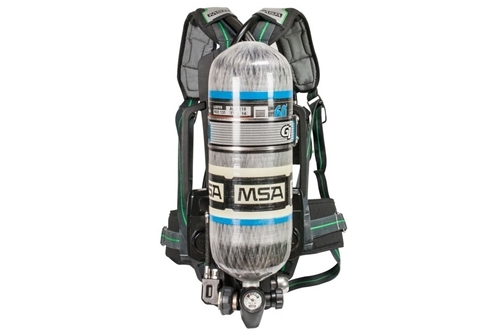 The patented Quick-Fill System lets MSA Air Mask users refill and transfill air cylinders while the SCBA is worn, without removing the air cylinder - even in IDLH atmospheres. MSA's RescueAire II Portable Air-Supply System provides easy-to-use, portable, and compact emergency breathing air. Designed for Rapid Intervention Teams (RITs), whose missions are to rescue downed first responders and others requiring assistance, the RescueAire II System is a lightweight and rapid solution for your team. The RescueAire II Portable Air-Supply System is compatible with all of your FireHawk MMR Air Masks, which also include the FireHawk M7 Air Mask.